Soup is something that, until a few years ago, I thought had to be really complicated. I’m not sure why/where I learned that, but I’ve most definitely moved away from that belief and am now 100% a fan of soups that are not complicated. 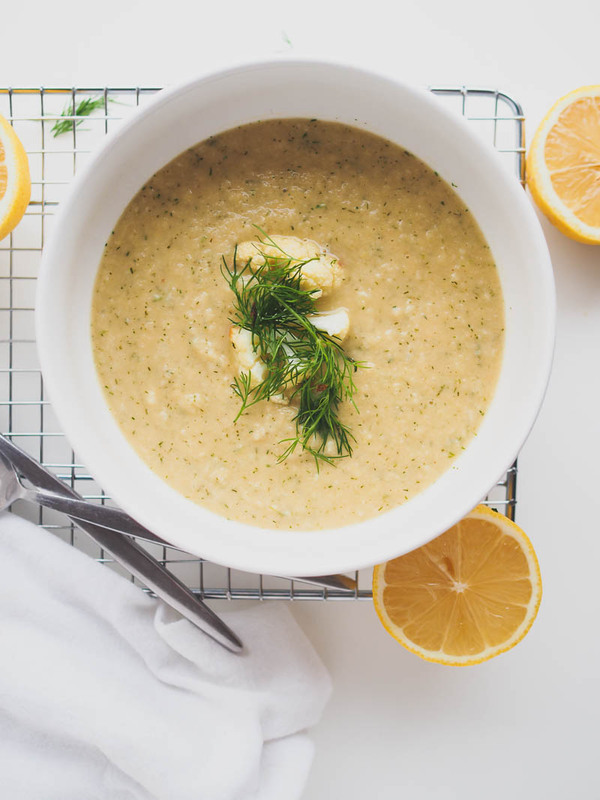 You don’t need 6 hours and a long ingredient list to have delicious soup. Last night I made a soup that took 20 minutes, had 5 ingredients, and was amazing. Also, that turmeric broccoli soup? SO so easy, and so so tasty. 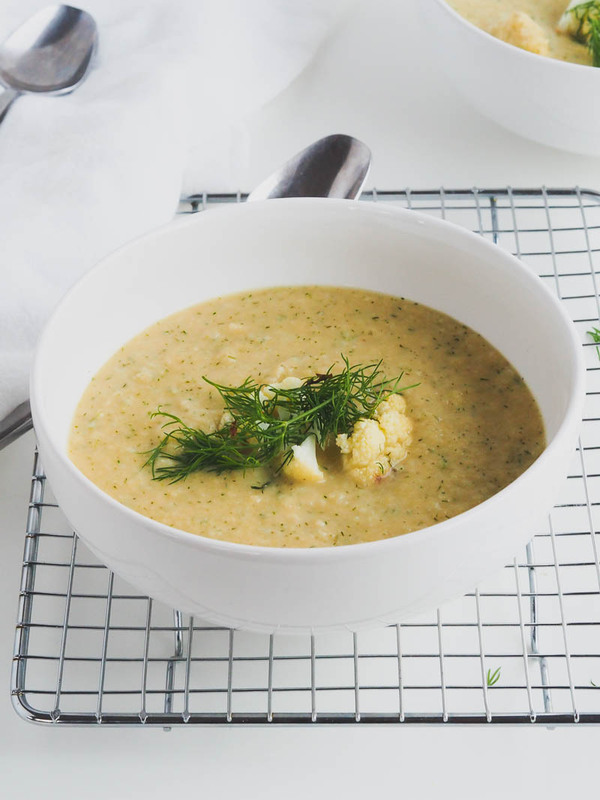 So, here’s another: Dill roasted cauliflower soup. Roasting vegetables is one of my favorite ways to speed up the soup making process (debatably — I know roasting takes time, but it’s so passive! ), while adding a depth of flavor you just don’t get from cooking on the stove. This recipe starts with roasted cauliflower — smothered in dill — and is relatively simple from there on. I opted for leeks instead of onions, garlic, celery seed powder, Pacific Foods Organic Vegetable Broth (as usual! ), white beans for some body, and lemon for a little tangy lift. It’s easy, quick, and DELICIOUS with a loaf of crusty bread. OH so good!! Need a little inspiration? 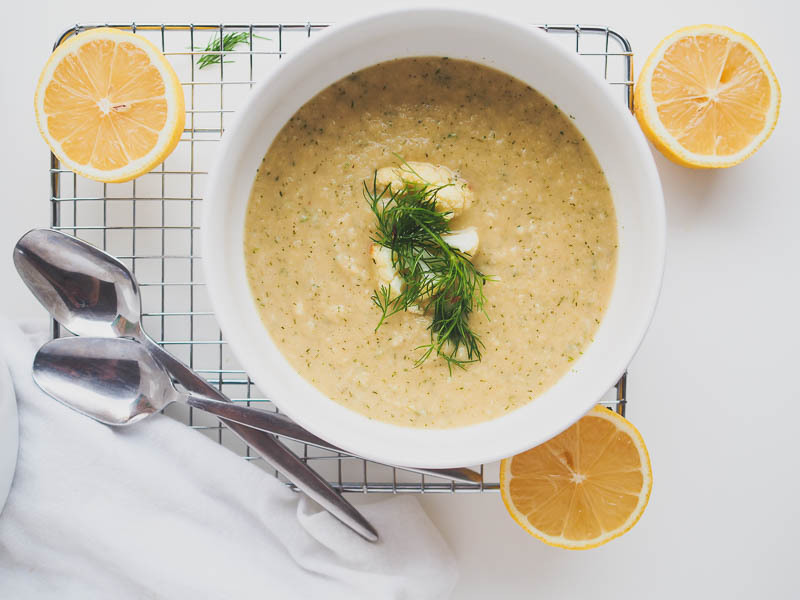 Here’s a quick video of making this soup — it seriously is this easy!! Get on it!! 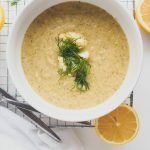 This vegan soup is hearty, healthy, delicious, and easy to make! 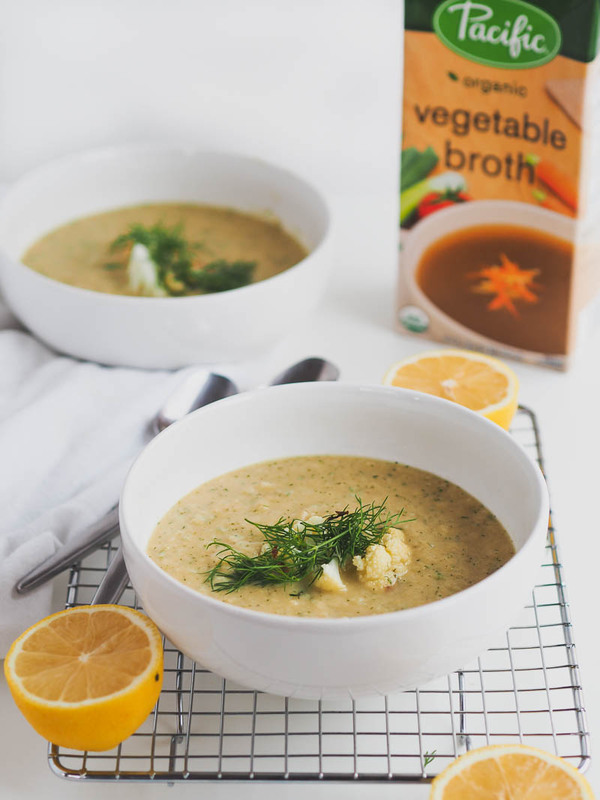 With the help of beans, cauliflower, and delicious broth, this soup is a winter favorite. Heat the oven to 400F. Toss the cauliflower with 1 Tbsp olive oil and half of the fresh dill. Roast for 20-30 minutes, or until fork-tender. In a stock pot, heat the remaining olive oil over medium head. Add the leek and sauté for 3 minutes, then add the garlic and celery seed powder. Cook for 30 seconds before adding the cauliflower, remaining dill, and broth. Bring to a simmer, add the beans, bring to a simmer again. Blend with an immersion blender, add lemon, salt & pepper to taste, and mix together. Serve hot with fresh bread!